Let’s face it – Kids’ haircuts are scary and stressful experiences. Traditional adult hair salons are simply not equipped to nurture young and sensitive children. That begs the question, why we do what we do at Just 4 Kids Salon ? It’s quite simple – we love to make children smile! First, there is a an unheard of free parking lot in back for you to arrive safely and efficiently. Next, our salon will greet you with bright and cheerful colors. Also, we boast an immaculately clean space, and a friendly staff that specializes in catering to children. We offer fun activities in our waiting area, as well as complimentary water and coffee for our guests. Once checked in, your little one will be overjoyed by the fun sports car salon chairs. Your child can “cruise in style” while getting their hair cut. In addition, each cutting station features a high definition LCD flat screen TV, equipped with just about every children’s show and movie ever made! Does your child like Mickey Mouse? How about Elmo, Peppa Pig or Thomas the Train? No problem! We can put just about any show you can think of to entertain your child. Finally, we boast the most comprehensive spa birthday party menu in New Jersey. All parties can be customized with specials and upgrades. Finally, all parties include our state-of-the-art light and sound system! 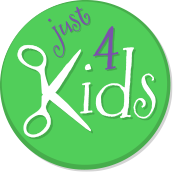 At Just 4 Kids, it’s never just a kids’ haircut – it’s a stimulating and unforgettable family experience! A salon service here will make your little one’s day, and a birthday party will absolutely make their whole year! Want to know first-hand why we are different at Just for Kids Salon & Birthday Party Boutique? Come on in today for a free tour and see for yourself! Call to get more information, or Book an Appointment Online today! “Whatever emotion you’re after, whatever vehicle you pursue — whether it’s building a business, getting married, raising a family or traveling the world — there are six basic, universal needs that make us tick and drive all human behavior. That’s sort of the way we look at it at Just 4 Kids Salon. We love our business, and we love making children smile. We want to be able to contribute to their growth! Also, we want to have a little significance in your lives, and form a strong connection. Finally, we would like to offer our clients the certainty of a great haircut, while offering your child some variety with our stylists as well as our different sports car chairs! Come by Just 4 Kids Salon, and see for yourself! We have a very dynamic social media presence, and are always posting great photos and ideas. Feel free to follow us on all our platforms! YouTube Page – If you like to watch videos about kids haircuts, first haircuts ever, toys, video games or even special haircut ceremonies like Mundan or Chudakarana, our YouTube channel is probably for you! Furthermore – Click and subscribe to our channel to watch our great videos, and get special offers and deals as well! Facebook Page – Facebook is the flagship social media page of Just 4 Kids Salon. On it you will find lots of great photos, inspirational quotes, and invitations to special events we are having. Finally – Just click the link and Like Us today! Instagram Page – Instagram is a great place to get interesting and local flair content from us, including incredible local photography, highlighting the very best that Hoboken and our salon has to offer. In addition, we like to provide interesting weather updates, and great photos of haircuts and birthday parties. So, what are you waiting for? Be sure to follow us on it!